This 2 bed, 2 bath apartment on the Mojon Hils complex has been finished to a very high standard, offering luxury accommodation combined with stunning sea views from an elevated position. This top level apartment has stunning views from the terrace over the`popular resort of Mojon Hills and the sparkling sea of the bay of Mazarrón. The apartment has been tastefully furnished to a high standard and offers comfortable accommodation for families and couples. This lovely duplex style holiday home is ideally located for family vacations, with easy access to the beach and all amenities. 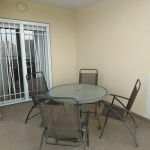 The house is in the El Alamillo area of Puerto de Mazarrón, a short walk from a supermarket, bars, and restaurants. Located on the exclusive development of El Pinar de San Gines, this three bedroom apartment is well equipped & has a large private rooftop solarium with stunning sea and mountain views. 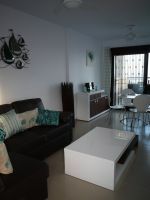 CDA02: Modern 2 bed, 1 bath apartment in Condado de Alhama, La Isla, with stunning views over the lake. Private parking space and 2 communal pools. This lovely apartment is located on the popular coastal development of Mojon Hills, close to the traditional Spanish village of Isla Plana. 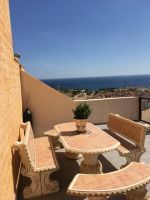 The apartment has stunning views over the sea and the Bay of Mazarrón and has large terraces which face the sun all day long!